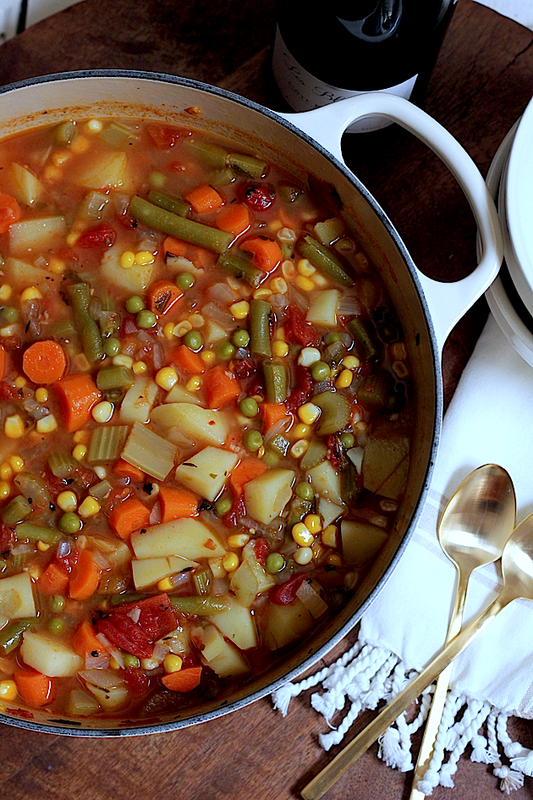 Savor Home: THE BEST SUMMER VEGETABLE SOUP... EVER. I've had lots of different vegetable soups, but this one is different... Why? I have a few guesses... Everything in this soup with the exception of the peas (they were frozen) and tomatoes (canned) was super fresh, in season, and organic. I literally picked everything up from the grocery store in the morning and made the soup that afternoon. The carrot tops were still attached to the carrots when I bought them. I swear they tasted fresher and sweeter. I cut the Non-GMO organic corn off the cob right before I added it to the soup. I used buttery Yukon Gold potatoes - the best. 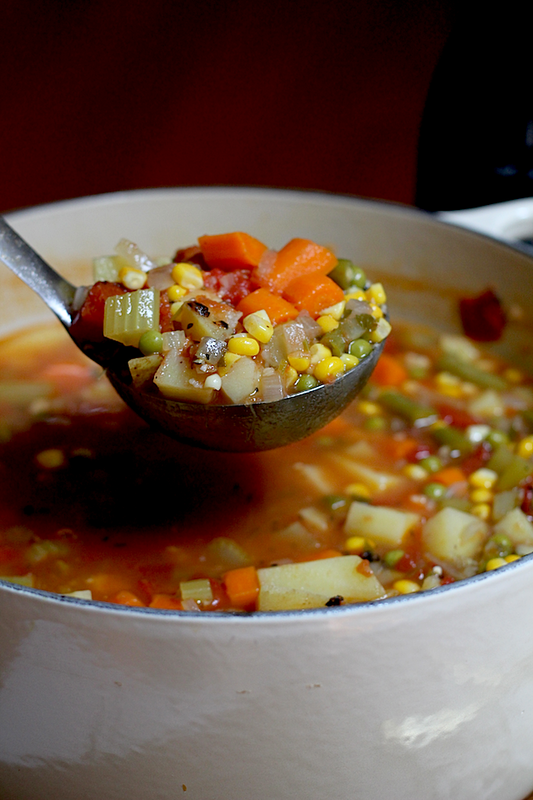 The soup cooks in 25 minutes, so while everything is cooked, the ingredients don't get soggy and over-cooked. It doesn't have a ton of seasonings (nor does it need it), so the fresh flavor of the vegetables really comes through. I've eaten this soup three times this week already people... It's definitely an all-time favorite!! COOKING TIP: Use "Mise en Place" when preparing this soup! That means to prepare all of the ingredients before you even turn the stove on! It makes the actual cooking process so much easier and faster. It takes 15-20 minutes to chop, peel, and measure everything for this soup, so turn some music on in the kitchen and make it fun! 1. Once your vegetables are prepared, place a large Dutch oven (I used a 7 1/4 qt Le Creuset Dutch oven and it was almost full) over medium heat. Once the olive oil is hot, add the onions, celery, and carrots to the pot. You want to hear that sizzle when you add them to the pot! Season the vegetables with a pinch of salt and pepper. Stir and cook for about 5 minutes. Add the garlic. Stir and cook for 30 seconds. 2. Add the potatoes, tomatoes, bay leaves, thyme, parsley, red pepper flakes, and vegetable stock to the pot. Stir and bring the soup up to a boil. Season again with a little salt and pepper. 3. Once it starts boiling, add the green beans. Turn the heat down to low, cover, and simmer for about 20 minutes or until the potatoes are fork-tender. 4. Once the potatoes are done, add the peas and the corn. Cook for another five minutes or so and then it's done! Taste it one last time and add more salt and pepper to taste if necessary. Serve with crackers or some good crusty bread. Enjoy! This looks amazing!! Is it odd that I wish I had some for breakfast…yum! Yum. Nothing better than fresh corn in the summer! This looks so yummy Tiffany! I'm trying to eat better so this fits the bill quite well!